"Plug in and start scanning. The Eagle III barcode reader really is that easy to setup and use." The Peninsula Eagle III barcode scanner allows you to read any bar code directly into any application without using additional software. The Eagle III barcode scanner reads the code and enters it into your application instantly when the bar code is scanned, with no need for extra software. The Eagle III is easy to set up, simply plug in and start scanning your barcodes. This barcode reader is the latest generation of our Eagle scanner, with many new features and enhanced durability. The Eagle III barcode reader can read all common bar code types, ie EAN- GS1 -13, GS1- EAN-8, UPC-A, UPC-E, Code 39, Code 128 and many others including full size ITF-14 (Interleaved 2 of 5), and GS1 - EAN (UCC) 128. 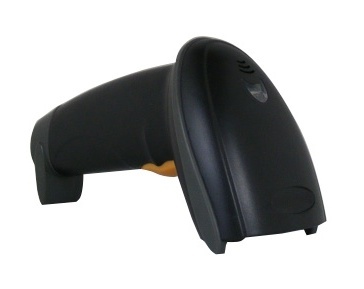 This barcode scanner has many programmable features including hands free, triggerless, prefix and suffix. The Peninsula Eagle III uses a laser engine which enables it to scan codes up to 180mm (7.8 inches) wide at a distance of up to 300mm (12 inches), this includes full size ITF 14 (GS1 14) outer box codes and GS1 - EAN(UCC) 128 barcodes. Low power consumption, 1 year RTB guarantee against defects in materials or workmanship (please see warranty details for information). Powerful yet cost effective solution to laser barcode scanning. Please note this product uses a laser and is not suitable for eye level applications, please see the Peninsula Kite Imager Barcode Reader as an alternative. Works with ALL computers, a simple cable change is all that is required. Quality built, light-weight units help combat RSI, with large ergonomic trigger. Fully CE approved. Works on Mac OSX inc 10.9. Available with interfaces for USB Keyboard or PS2. Laser Barcode scanner. Reads larger codes up to 12 inches away.